Bluebloods always enjoys having a chat with Tyreel’s Linda Monds, such is her passion and enthusiasm for thoroughbred racing and breeding. With great sales and racetrack results behind them, the Tyreel team have plenty more to look forward to including an exciting Australian Easter Yearling Sale. How many years have you been selling at Easter? Tyreel Stud has been selling yearlings at the Inglis Easter Sales for many years and since 2014, under our ownership, we have presented yearlings each year. Tell us about your farm, the facilities and how you prepare your Easter draft? Tyreel Stud is a boutique thoroughbred breeding operation located in the Hawkesbury Valley district within the Sydney basin. It is an iconic farm within the industry and is renowned for breeding good quality racehorses. Tyreel Stud has a quality broodmare band who are producing outstanding physical types which in turn are going on to perform with distinction on the track. 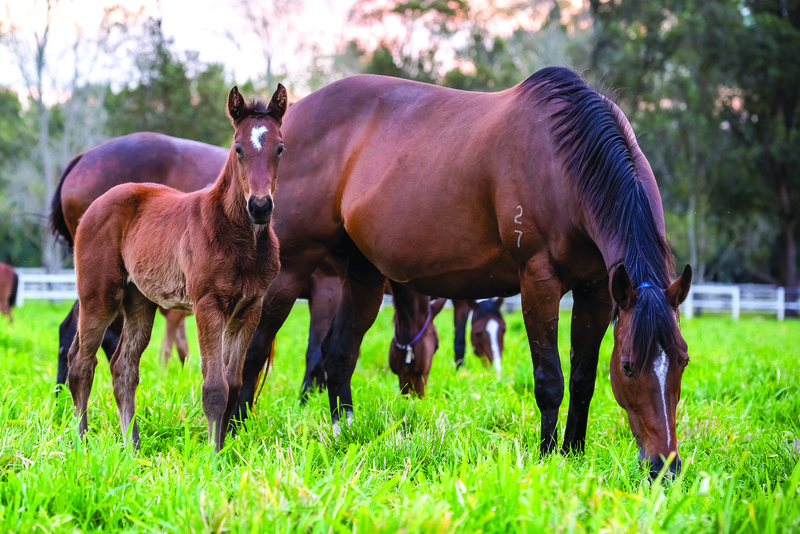 We have a small number of clients with quality broodmares who agist permanently with us and we manage their broodmares, foals, weanlings and yearlings alongside our own. Tyreel Stud’s facilities include a fully equipped foaling area with a modern barn consisting of 13 large mare/foal boxes adjacent to ten safe day yards. We have a yearling barn and yearling preparation area which consists of an eight-horse walker, covered lunge ring and twelve yearling runs and small yards. Our yearling preparation extends over a ten week period and is tailored to the individual with the first couple of weeks getting them used to the system and introducing some exercise. Over the following weeks their exercise is increased on an as need basis, working on areas that needs improvement or just enhancing their natural physical appearance. Tyreel Stud prides itself on quality horses and caring, qualified, dedicated staff. Have you discovered a new favourite restaurant or hotspot at Warwick Farm? During the Inglis Classic Yearling Sale we chose to stay at the Holiday Inn Warwick Farm. The location was perfect with just a five minute drive to the complex. The accommodation and restaurant/bar was great. It was good to have an accommodation venue that provided everything that you need without having to venture out for meals. The new Inglis Riverside Complex is an absolute credit to all who have been involved. The massive task of design and integration of facilities is to be admired by the thoroughbred industry worldwide. The stabling is well planned, its appearance and the multiple parade area surfaces are fantastic. The stables have great air flow with the high roof structure. The facilities for staff, vendors and purchasers have been also well thought out. The foresight of including a quality hotel on site is great for the industry and the local area. The Inglis Riverside Sale Complex has brought class and style to the industry with the way it has been designed and the way the entire Inglis team present themselves; they have definitely set the bar at a higher level. We are looking forward to continuing our great association with Inglis and feel honoured to be able to present our yearlings in the best possible way we can. Lot 66 br.f by I Am Invincible from Catalonia (Flying Spur): second foal (her first by More Than Ready fetched $625,000) of a stakes placed 3/4 sister to Group Three winner Jorda from the family of Group winners Detours, Aichi and Hioctdane. Lot 249 b.f by Medaglia d’Oro from Morrego (More Than Ready): “a quality filly with grace and style,” she is a half-sister to the two times Group placed eight times winner Klammer and to a $300,000 Redoute’s Choice filly who has recently trialled well at Randwick. Her dam is a city placed half-sister to three times Group placegetter Nadeem Lass and her third dam, the Group Two placed Marrego, is dam of five times Group One winner Eremein, the Group Three winner Peace Force and the Listed winner Gliding. Lot 362 b.f by All Too Hard from Smiles For Layla (Zabeel): All Too Hard has already sired a Group Two winner (Demonetization) out of a Zabeel mare and this filly, described as being “strong, balanced and good bodied with a great attitude,” is the first foal for a dual city winning sister to Light Fingers Stakes-Gr.2, 1200m winner Adrift and half-sister to the Karaka Million-RL, 1200m winner Dan The Man from the family of W.S Cox Plate-Gr.1, 2040m hero Maldivian.